The STI is an integration framework for deploying smart sensors and/or advanced communication interfaces. Based on the customized configuration, the STI becomes either: (1) a smart sensor with advanced and customizable features or (2) a communication bridge (wired, wireless RF, or wireless ultrasound through solid barriers). The STI is “smart” because: it includes a digital core with machine-readable Transducer Electronic Data Sheets (TEDS); the control and data associated with transducers are digital; triggering, status, and control are provided to support integration of legacy or new transducers into the STI; and intelligent software functions (such as neural networks) can be included. The STI inherits the advanced characteristics of AGNC’s past smart sensor products: Autonomous Intelligent Sensor for Tracking Systems (AISTS) and the coremicro® Reconfigurable Embedded-Smart Sensor Node (CRE-SSN). The CRE-SSN is a general purpose smart sensor system with a communication stack consisting of commands and reply messages under the IEEE 1451.0 (Dot0) standard and has an automated mechanism for transmitting fault diagnostic messages regarding itself, attached transducers, or monitored systems. For an optimized SWAP-C system with vibration signature recognition, the AISTS was designed for ultra-low power consumption, embedded adaptive pattern recognition by embedded neural networks, and uses a state of the art radiation ruggedized Ferromagnetic RAM (FRAM) device with advanced hardware features. 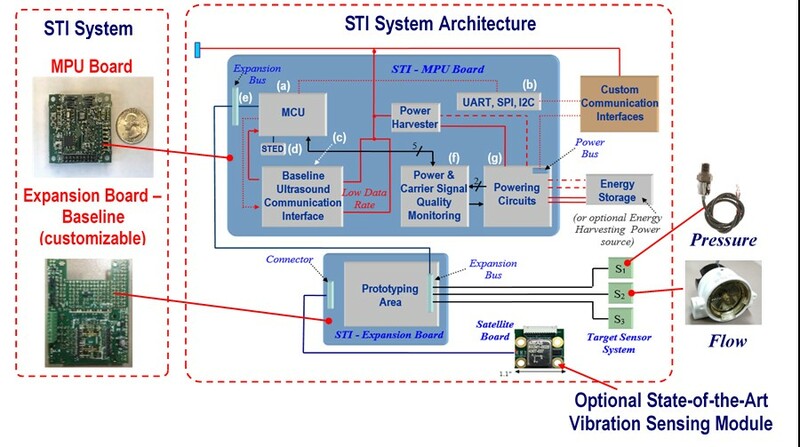 The STI blends all these capabilities to obtain a customizable hardware and software framework with operation capability at energy harvesting power levels. The STI baseline ultrasound communication includes interfaces for thin metal walls and low rate data transferal (max 10 kbit/s). In the case of thick walls, higher data rates, or if different types of structural materials are targeted (such as composites), the STI’s ultrasound interfaces can be customized. 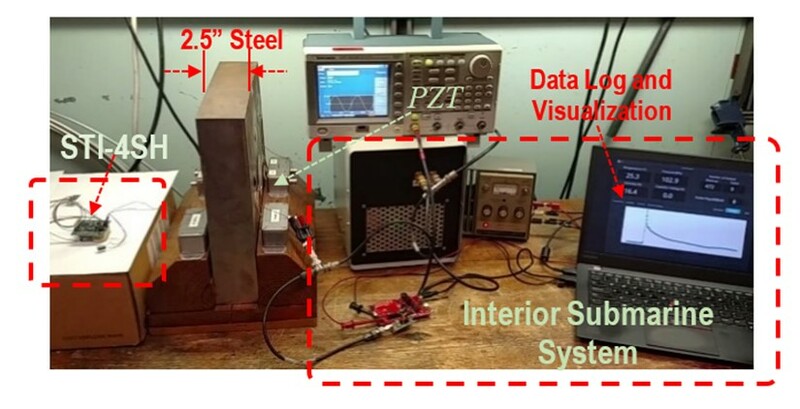 For example, the Application Example below shows how the STI was customized for ultrasound communication and powering across a thick steel wall. As shown in the STI’s block diagram below (large blue rectangle), the MPU board consists of: (a) an ultra-low power consumption processor with FRAM technology from Texas Instruments (MCU block); (b) easy connections to a flexible array of standard ports (UART, SPI, and I2C); (c) cutting edge baseline ultrasound communication interfaces (as in the AISTS main board, http://www.americangnc.com/products/AISTS.htm) and external customized interfaces; (d) embedded standalone temperature event detector (STED) within the STI digital core; (e) expansion bus; (f) power and carrier signal quality monitoring; and (g) powering circuits. The satellite board (depicted at the bottom right) is a small and compact board with a high performance triaxial analog accelerometer and an ultra-low power digital triaxial accelerometer (with rich features support and the ability to awaken the MPU board from vibration events). where by using the STI-4SH system, highly reliable data transfer was successfully achieved through 2.5” thick steel.